When we last heard from DJ Vadim, the Russo-British producer was struggling with eye cancer. Thankfully, he had a successful operation to remove the cancer, and then finished his latest album, U Can’t Lurn Imaginashun. The album drops via BBE Music on May 12. MP3s and a YouTube video for the first single, “Hidden Treasure,” are posted below. Though producer/DJ’s these days are a dime-a-dozen, a veteran like Vadim is not the kind o’ cat to release 12 tracks of the latest in-vogue soul loop. 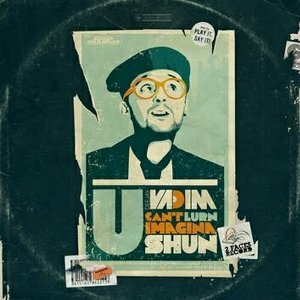 In fact his new album, “U Can’t Lurn Imaginashun” is one of the sickest joints on the block, continuing – and embellishing – the producer’s inventive journey into the realm of sound. Anyone that knows anything about Vadim knows to expect the unexpected, and “UCLI” has surprises – and dopeness – in abundance. Out of the negative comes the positive. And “U Can’t Lurn Imaginashun’ is all about mining the deepest parts of the psyche to find inspiration. It’s about how, even though we learn so much at school – courses in languages, computer studies, science, religion, sport – and live in a time of unprecedented technological prowess (phones, computers, ipods, music software), imagination is the one thing you must journey deep inside yourself to find. This entry was posted in News and tagged BBE, DJ Vadim. Bookmark the permalink.